Gorgeous views creating instant relaxation. Spacious 3 bedroom home for you to relax and enjoy the tranquillity of the surrounds. Two double bedrooms with a queen bed in each, a single bedroom with two single beds, and a portable trundler bed gives sleeping for 7. Plenty of room to relax in the lounge looking out at the view. Look out onto the local stream in the forefront and the hills & sea beyond. A lovely new log fire warms the house in the winter months brilliantly. In the summer months a ceiling fan keeps you cool, and with the French doors out onto the front deck, it’s the perfect place to unwind. Walk to the end of the section and 1 minute you are on the beach. A very safe area for children to explore the beach. A perfect place to bring your boat with a turn-around driveway and plenty of parking space off the road. Numerous swimming holes in the gorgeous Te Mata Creek– it truly feels like heaven on earth – and of course there is the sea to swim in too. Did you wonder what to have for dinner? – pipis, cockles, oysters & mussels aplenty – and of course an ideal place to fish from. You can go out from the creek with your boat on the tide, or Waikawau Boat ramp is only 5minutes drive away. Surf cast off the beach or rocks – and go for a walk on dusk and see the shag colony settling for the evening in the trees around the corner. Sunsets are stunning from the beach – every one a postcard photo. Lots of places to walk and explore, bush walks and cafes within 10 minutes drive – (both the beautiful Ruapara Café & gardens and Waiomu Café). 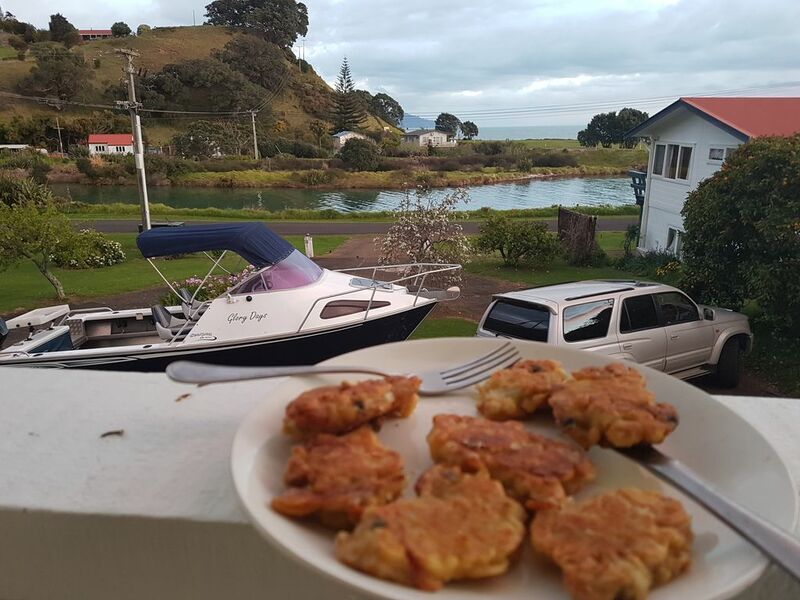 Tapu Dairy (which has great ice-creams, takeaways, and more), and the Tapu Hotel for those wanting a full meal are just 3 minutes drive away. Thames is 20 minutes drive away where there is always the Saturday Markets, and if you go north, Coromandel Town is only 40 minutes drive away. Precious memories are waiting to be made here - Come and enjoy. Under kiwi bach tradition please bring your own linen (towells/sheets/tea towels). Visitors to leave bach clean and tidy on departure. Thanks Phil, glad our beachhouse worked out well for you. Thanks so much for your review. Great bach great location for fishing and relaxing enjoyed every minute here . Awesome - glad you liked it. Thanks. Awesome, spacious & well presented bach in peaceful location! Thanks Rhonda & Pete for the lovely review. And thanks so much for the care you took in leaving the beach house - much appreciated. We look forward to sharing our place with you again. Loved our stay here - Close to boat ramp and great swimming spot in the river, as well as the beach across the road. Kids and Fisherman all very happy. Thank you. Awesome - glad you loved your stay. Thanks for the stay, great place and had every thing needed. Clean and tidy. Good old kiwi bach. Glad you liked our 'home away from home'. Thanks for staying, look forward to you staying again some time. Thanks for your review. Has everything you need to just chill and enjoy a break. Glad you had a relaxing time, it was great to have you stay - thanks for your review.